Use this easy MLS property search tool on the right to search for any criteria that you want to look for. 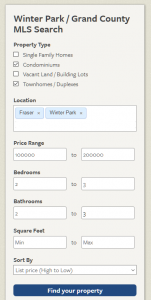 For instance, if you want to search for condos & townhomes in Fraser, first check the property types that you want. Then type in “Fraser” in the location and the search engine will start giving you drop down choices after the first letters. Just select “Fraser (City)”. 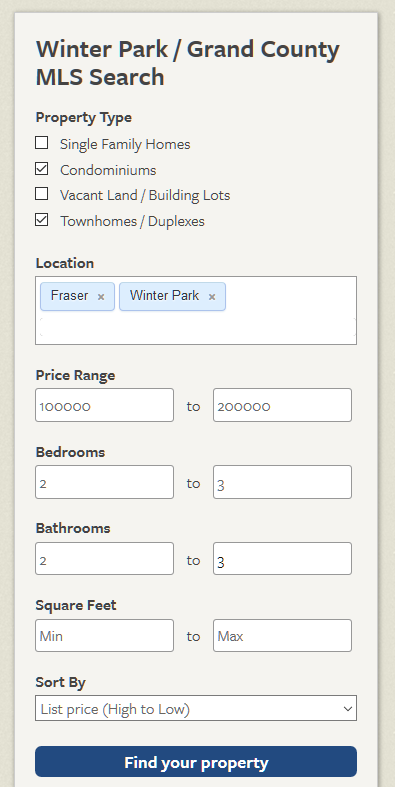 Then if you want to add Winter Park, start typing and you will get a drop down selection for “Winter Park (City)”. You can also select whole areas (such as the “Winter Park Area” or Grand Lake Area”).